This is the story of the season that made "The Gashouse Gang" one of the most famous teams in baseball history. Jay Hanna Dean and his wife Pat headed to Florida early for the 1934 spring training. The couple arrived in Bradenton December 22. "Dizzy" enjoyed hunting, fishing, and playing golf as he awaited the arrival of his St. Louis Cardinals teammates. 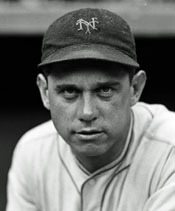 Dean had burst onto the National League scene in 1932 when he went 18-15 and led the league in innings pitched (286) and strikeouts (191). He reached the 20-win plateau in '33 although he lost 18. He topped the NL in games (48), complete games (26), and whiffs (199). After winning the World Series in 1931, the Cardinals had fallen on hard times. 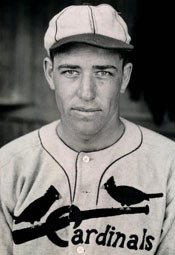 Dizzy, the congenital braggart, predicted as early as January 18 that he and his younger brother Paul would lead the Cards to the pennant. "How are they going to stop us? Paul's going to be a sensation. He'll win 18 or 20 games. I'll count 20 to 25 for myself." That was quite a boast considering Paul had yet to throw a big league pitch. Dean the Elder looked forward to firing the newly-designed baseballs, which were livelier than the ones used in the NL in previous years. 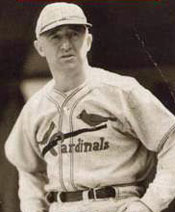 Frankie Frisch, age 36, had taken over as manager of the Redbirds from Gabby Street during the 1933 season, winning 36 against 26 losses the rest of the way. Once the darling of Giants manager John McGraw, Frisch had come to St. Louis in a trade of outstanding second basemen with Rogers Hornsby heading to the Big Apple. The switch-hitting Frisch continued to ably man 2B and hit .303 in '33 after having his streak of .300+ seasons snapped in '32. The "Fordham Flash" made no bones about the fact that he would manage in the style of McGraw, for whom he played eight years. 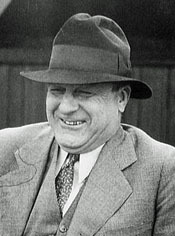 Some players referred to the Cards skipper as "John McGraw Jr."
Considered a hard taskmaster, Frisch nevertheless enjoyed the "unqualified loyalty" of his players. He was fair, considerate and insisted on sound, fundamental baseball. "I'm the boss," said Frank. "I'll call all the shots. The boys will come to me for all instructions. No one will nod me off on a signal. I'm the yes-guy on this ball club." Baseball writers agreed that the New York Giants, were the team to beat in the National League in '34. Like the Cards, the Giants were led by a player-manager - 1B Bill Terry. Like Frisch, Memphis Bill had taken over the managerial duties during the middle of a season - 1932, when McGraw shocked the baseball world by announcing his retirement. In his first full season at the helm, Terry took a team predicted to finish sixth and led them to a 91-61 record to win the pennant by five games over the Pirates. Then New York needed only five games to dispatch the Washington Senators in the World Series. Terry took a trip to New York to talk with writers January 25. 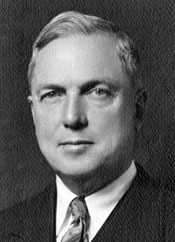 He proclaimed Pittsburgh, St. Louis, and Chicago as the teams to beat. When asked "Do you fear Brooklyn? ", Big Bill gave an answer that would come back to haunt him. "Is Brooklyn still in the league?" When the Cardinals reported to Bradenton March 5, one player was absent. Paul Dean, who won 22 and lost 7 for AAA Columbus in '33, held out for $1,500 more than the Cardinals offered. He had the complete endorsement of his older brother. "Yes, sir, Paul has a job all lined up, and he's not going to pitch unless the Cardinals pay him. The club offered him a raise over what he got at Columbus, but it wasn't enough for a man of his skill. It was the same salary the club offered other young pitchers, and Paul ain't an ordinary pitcher. He's a great pitcher. He's even greater than I am, if that's possible." Paul arrived in Bradenton and signed his contract March 11. Although salary terms were not disclosed, both sides declared they were satisfied. The Dean brothers met the press and, as always, Dizzy did all the talking. "We're going to win between us 40 or 45 games this year." When asked, "How many will Paul win?" Jay replied, "I don't know, but I guess he'll win more than me. 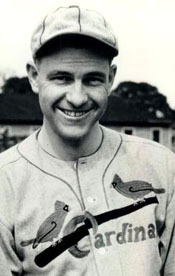 You know Paul's a great pitcher, got lots of stuff ..."
Spotting Cardinals owner Sam Breadon, Dizzy called out, "If we don't win 40 or 45 games between us, we'll give the money back to you ..."
Dizzy confidently predicted a pennant. "It will require about 95 games to win the pennant, and the Giants can't take that many. That's why we will win." One writer described the brothers Dean like this: "Both are tall, rangy. Diz is almost four inches over six feet. Paul is about an inch shorter. They weight about the same, between 190 and 200 pounds. Paul looks his age, 20 1/2 years. Dizzy, 23, seems older. But if you look only at their pitching motions, their windup, their delivery, they are identical twins." Paul contrasted his pitching approach with his brother's this way: "I was an overhand pitcher, but I'm side arm now, just like Dizzy. .... after he came back from his first year in the minors, 1930, ... he showed me how he pitched. So I took after him." Dizzy said his fast ball is not as fast as Paul's, but his curve is better. But Paul said this: "We both rely on our fast ball more than our curve. I didn't have much of a curve until last year, when it started to break well." With the Great Depression still plaguing the economy, almost all ML teams cut salaries for many players. 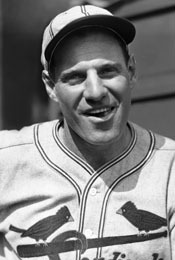 Two Cardinals unhappy with what GM Branch Rickey offered were SS Leo Durocher and OF Ernie Orsatti. Durocher was asked to take a cut of $3,500. "I realize that conditions require most of us to accept smaller salaries. But when you ask a man to take $5,000 instead of $8,500, that's too much." Orsati: "I thought I was fair in my salary demands, but Mr. Rickey insisted that I accept a 25 percent cut. That's too much." But only the most talented ballplayers had any leverage in negotiations in that pre-free-agency era. So all the Redbirds signed their contracts. A poll of sports writers on the outcome of the NL race was relieved just before the start of the season. 40 of the 97 reporters picked the Giants to win the pennant. 34 chose the Cubs while only 13 selected the Cardinals. St. Louis fans showed their excitement for the '34 season with the largest opening day crowd at Sportsman's Park in three years. 7,500 turned out on a Wednesday afternoon to watch Dizzy Dean twirl a 7-1 victory over the Pittsburgh Pirates. A Pittsburgh scribe wrote, "Jerome the Dizzy hurled a fine game as he limited the Pirates to six hits. His fast ball was smacking like a pistol in Spud Davis' mitt in the closing rounds." The Redbirds' opening day lineup read like this. The much heralded younger Dean toed the slab the next day but "the Bucs gave Paul Dean a terrific shellacking in his first big league appearance. Dizzy's younger brother, who pitched only six innings during spring training, lasted only two ... the Pirates rushing 4 runs across on 5 hits ..."
That was the first of five straight losses for the Redbirds and seven of the next eight. Included in the dreadful streak were a game in which the Pirates scored 14 and another in which Cubs crossed the plate 15 times. After nine games, RF Rothrock was hitting only .214 and slugging 1B Collins just .200. SS Durocher stood at .179, but he was in the lineup for his fielding and leadership, not his bat. Frisch was still searching for a reliable CF. Lippy Leo had an excuse for his poor start at the plate. On April 18, he was granted a divorce from his wife on grounds of her infidelity. He was ordered to pay $25 a week for the support of their three-year-old daughter. Dizzy lost his second and third starts and had an ERA of 6.60. Paul was even worse at 12.00. Not the start the elder Dean imagined when he predicted 45 wins between the two of them. The National League standings looked like this on the morning of May 1. 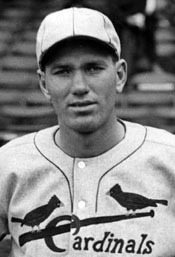 Dizzy Dean died July 17, 1974, at age 63. What Cardinals' pitcher recorded his 3,000th strikeout that same day. Did the Cardinals Threaten to Strike against Robinson?